According to the American Heart Association, salmon has more than 2X the omega-3 fatty acids as other seafoods. Omega 3’s, 5, 6’s, 7 and 9’s belong to a group of fatty acids often referred to as “good fats.” The benefits of these oils are numerous – they serve to nourish brain, heart, eye and kidney tissues. They have been shown to benefit immune system and digestive system health in addition to supporting healthy metabolism and a positive mood. New Chapter® is proud to offer a whole-food approach to fish oil and an alternative to the fractionated, high-heat processed and “purified” oils on the market today. From pristine, protected Alaskan waters, Wholemega® andWholemega® Prenatal are 100% wild-caught salmon oil; rigorously tested to ensure each capsule delivers Nature’s whole basket of vital fatty acids and beneficial nutrients. The brilliant hue in Wholemega and Wholemega Prenatal comes from Astaxanthin – an extremely powerful antioxidant that is naturally found in wild salmon and abundant in this extra virgin fish oil. While traditional fish oil processing can destroy this vital compound, the low-heat “pressing” used to extract Wholemega and Wholemega Prenatal preserves this antioxidant as well as the natural color, clarity and viscosity of the salmon oil. The oil in Wholemega and Wholemega Prenatal is so pure and untainted, it is delivered from a “food grade” government inspected facility. It’s our promise of healthy, and pure, food to you. For optimal benefit, fish oil must become incorporated into cell membranes where it serves to modulate cell signal events (e.g. modulate inflammation) and increases membrane fluidity. 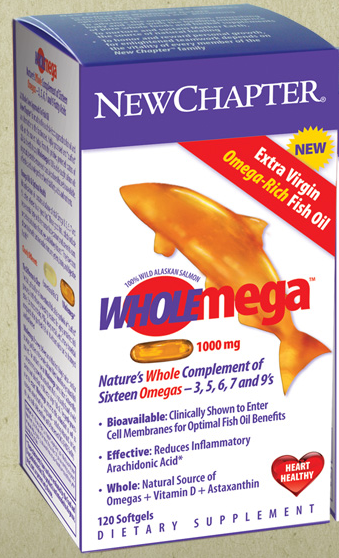 As demonstrated in a human clinical trial, Wholemega has been shown to incorporate into peripheral blood mononuclear cells (PBMCs) – allowing fish oil to provide its beneficial effects. Emerging research suggests the whole omegas found in a naturally pure fish oil like Wholemega Prenatal may play an important role in delivering critical DHA to a growing baby. That's why Wholemega Prenatal is 100% naturally pure wild Alaskan salmon oil, with nature's whole complement of vital omegas -- important for baby's brain and eye development* -- plus vital nutrients other fish oils process out, like natural Vitamin D.
One of New Chapter’s guiding principles is to do no harm – to people, to animals or to the environment. That’s why Wholemega and Wholemega Prenatal come from 100% sustainably wild-caught Alaskan Salmon. Alaska maintains one of the World’s most highly protected and managed natural fisheries and has outlawed salmon fish farming. By using only wild, sustainably caught Alaskan salmon – among the cleanest and most pure fish stocks in the World – chemical processing to deliver purity is not required. If sustainability is important to you, Wholemega is a fish oil you can feel good about. My wife Kaylee and I only take this fish oil supplement for about 7-8 months. Before tried this wholemega I see this product in internet then I take a step for trying this stuff. I have an issue with digestive system and my wife take this for refreshing their mood. I'm simply described our experience that this one is really effective and a trusted product which extremely give huge improvement. The New Chapter brand is absolutely the best and wife glad to see that what a relief they deliver. I never tried other fish oil product because I believe on this due to the great source of "EPA & DHA” and want to continue use it.